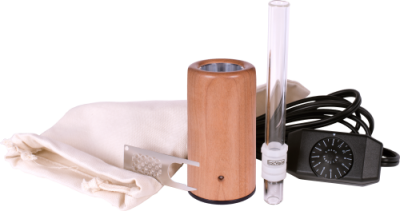 The perfect ‘GonG’ (Glass on Glass) accessory for mating your E-Nano with your favorite water filter. The perfect 18mm Adjustable GonG (Glass on Glass) accessory for mating your E-Nano with your favorite water filter. Uses our exclusive 18mm adjustable gong with a stainless steel basket screen so you can adjust your bowl size to suit your style. Polished joint eliminates ‘joint lock’. 18/19mm adjustable GonG comes complete with a silicone sleeve to prevent burns when removing from your water piece. GonG is packaged in a spill-proof plastic container for easy cleaning. This product fits a standard 19mm joint. Your vaporizer and water pipes are serious investments, and you’ll be able to keep it operating in peak condition by choosing the right accessories. This handcrafted piece of glass is great at what it does. I flipped the basket screen upside down so it’s more basket style ;) just personal preference though. This is my favorite way to vaporize flowers. Attached to my Crystal Fog bubbler, it’s an unbeatable combination. Thanks Epicvape for supporting US Glassblowers! Clever that the packaging doubles as a cleaning apparatus for the stem that came in it!